What would Valentine's Day be without a beautiful bouquet of flowers? In addition to chocolate, cards and dining out, flowers — particularly roses — are among the most popular gifts. According to a survey by the National Retail Federation, 58 percent of American men and 16 percent of American women were projected to buy flowers for Valentine's Day 2016, spending a total of $1.9 billion. Similar spending is predicted for in 2017. Flowers of all shapes, sizes, colors, and aromas can make popular gifts this February. Prolonging the life of beautiful blooms is a priority for those who want their Valentine's Day arrangements to endure for as long as possible. Florists and other experts differ with regard to the best methods of preserving flowers. Here are some ideas to try. The natural emollients and sap in the stems of flowers may cause a film to form over the bottom of the stem after it is initially cut. This can reduce the flower's uptake of water. To alleviate this, cut the stems once the flowers are home. A 45-degree angle allows for the absorption of the most water. You can recut them at each water change as well. 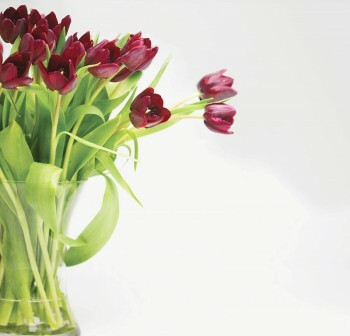 Be sure that vases or other vessels you use to hold flowers are completely clean. Bacteria can cause the flowers to decompose prematurely. Use a diluted bleach-and-water solution to clean vases thoroughly between uses. Sunlight and heat may dry out the blooms. Prolong the life of flowers by placing them in the darkest, coolest area of the home. To preserve flowers, do your best to reduce bacteria, provide a food source for the flowers and manage the pH so that the uptake of water will continue to be strong. Sugar can be an adequate food source. Gardenista, a floral arrangement and gardening resource, tested a variety of methods for preserving flowers and found much of the same results across the board. These included vinegar and sugar, conventional flower food, bleach, aspirin, and a penny. The bleach, aspirin, copper penny, and vinegar work as antibacterial agents. The sugar and the plant food help nourish the blooms. In the trials, most of the blooms remained strong for three to four days. Although many desire an arrangement of all opened flowers, bouquets that have some closed buds or those that are just beginning to peek out will likely last longer than bouquets that have already bloomed. The flowers will continue to open and wilting flowers can be removed to make room for the others. Keeping Valentine's Day flowers looking fresh and vibrant takes a few steps. By being diligent, that floral arrangement can last for several days.